Stereoscopic 3D? But that doesn’t seem quite right. You gotta be kidding me. Sony? Spot the difference puzzles! I love those. I’m going with Occulus Rift support. I was thinking it was obvious. Looks like Oculus support to me! That’s stereoscopic 3D… cross your eyes until the images overlap, and you can see the scenes in 3D! Also, the image names are “vr1” and “vr2” – for “Virtual Reality”? As if I weren’t excited enough for this game as it is… Awesome! It means Sony’s been working on their own Oculus Rift-style VR headset? And The Witness will be a compatible title? Ah, a real teaser. I imagine Jon laughing to himself. This seems connected to the fish-eye lens stuff you guys did a while back. Oh thank god, this was #1 on my wishlist of Rift-compatible games! Thanks Jon and team!!! 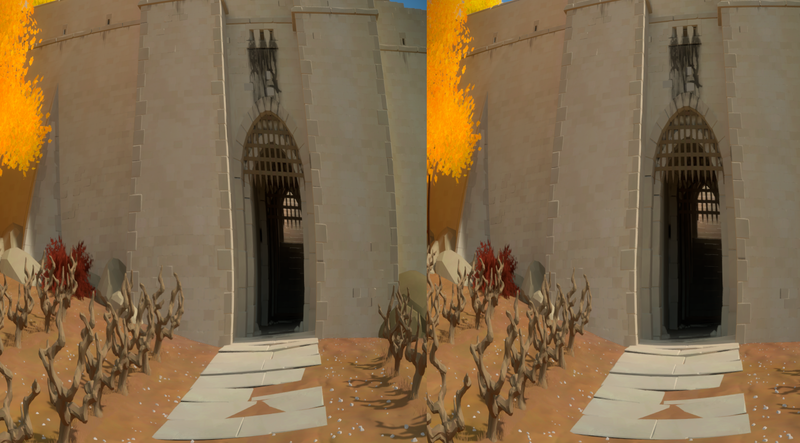 The Witness seems like the perfect for the Rift. Nice to see you guys experimenting with new technology! – They’ll be shipping the game with a bottle of rum included and distorting the images to make the experience even more surreal. – They’re experimenting with a series of shower curtains and do demo renderings of how they will be distorting the imagery. I would assume there’s only no 3D effect here because they don’t want to overhaul the rendering pipeline to support stereo rendering until they are sure that it’s worth it. All they would have to do is stand in two different locations and take two different screenshots. All they did was distort the right image; if you cross your eyes you can see it’s just a bulge. Split screen multiplayer puzzle solving? Do you have a Sony prototype of the VR glasses? Can’t wait to play the game in VR :) … hope there will be Rift support. If this means what I think it means, you just made me the happiest man on Earth :D The Witness will look gorgeous in Oculus Rift! Oh man, I really, really hope you’re exploring the possibility of adding Rift support. I’m super hyped about this game already, but that would really put me over the top. Wow as a big fan of Braid, if The Witness had support for virtual reality on PS4 it would be incredible, I think it’s the kind of game that would take a lot of advantage of the medium, and I’m sure Jonathan would find amazing ways to use the virtual reality for some incredible puzzles! Most likely VR (just look at the filenames). But would that mean Rift support, or would it be just for Sony’s future HMD? Or perhaps whatever strange VR thing sony were rumoured to be working on? I’m thinking “split-screen” and “frenetic multiplayer puzzle deathmatch mode”, am I right? Download the pictures and they’re labeled “vr1” and “vr2.” This is definitely Virtual Reality, and that’s pretty awesome! I think it means the team is getting some entertainment watching speculation run wild. Personally, I’ll find out when I play the real thing. Of course it means Oculus Rift support. “The Witness” can’t possibly be for SONY’s HMD only, as that POS stinks on ice. from people [particularly The Verge & WIRED] just moments after they tested it out. Summary: It’s like sitting in front of a big TV/Not at all immersive. Go on & look, you’ll see …. The Witness will be released on the Fisher-Price View-Master? I’m with Ulf. Whether or not this is meant to imply virtual reality, these particular images have no 3d effect except a slight distortion on the left side. I grew up with Magic Eye books, and these don’t work. I was sure this would mean Oculus Rift support but the doubt thrown in by others means I can’t tell if it’s for some other device or both. It does put me in a quandry. I’ve entertained the possibility of buying a Rift once they go full commercial but I don’t know how serious that wondering really is. But if my most anticipated game for the past 3 years comes out on this and is the best way to play it, then I don’t know quite what I do. Will be even more conflicted if a VR version is not with the Rift which seems to have the momentum or it doesn’t release on that on Day 1. 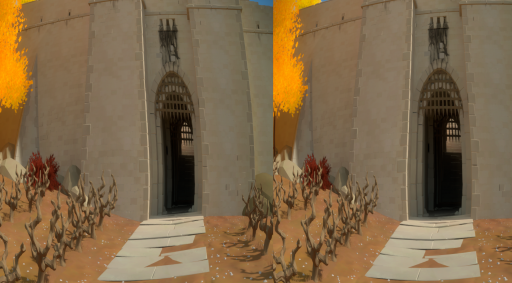 Strange that, if it’s for 3D/VR/OR support, the images show no detectable parallax (see the branches in the foreground, for example, which should show the strongest between-eye differences and show none), and correspondingly, the images have no depth when viewed either crosseyed or walleyed. There is clearly distortion but not parallax. Both sample images show the same pattern: squeezed on the left, swollen on the right. I have no idea what this means. But it is a terrible demonstration of 3D, suggesting (because JB is not one to mess around) that it is an awesome demonstration of something else. Why do you assume it’s definitely not Oculus? Back up your argument. This image is cropped to eliminate the trademark rounded border that you see in oculus screenshots, but make no mistake, it is definitely distorted. Notice how straight lines in the first image are curved. Also notice how the left and right eye images aren’t even the same width, and the images are not a standard screen resolution, or even, indeed, the same resolution between the two images. This points to the images being cropped and otherwise manipulated. They do seem to be parallel 3D images (so going wall-eyed is the proper way to see it, rather than cross-eyed). I think there’s not a lot of obvious parallax because the images are cropped down / zoomed in from larger images. Everything we’re seeing is relatively far away. This could have been done to cut down on the obvious fish-eye that straight Oculus screenshots have, to make it harder for us to figure out! It also means that looking at the images wall-eyed on a monitor is actually viable. I don’t recommend trying to look at these crosseyed! Terrific — and ties up the seeming oddities nicely. Now on to the haptic feedback for apple blossoms brushing against your cheek as you walk past, right? I don’t like 3D TV; I do not think there is any point to it. Well if you compare 3DTV to VR, than yes… but I personally enjoyed Assasins Creed 3 on PS3 in 3D mode, especially when I was in bigger forest areas..
Why is the left side wider than the right? 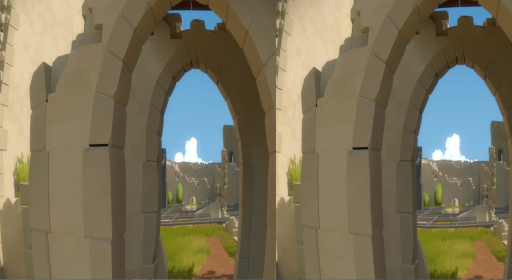 The Witness is exactly the type of game that the Rift needs. I’m excited! It might be the deciding factor for me in getting one. I wouldn’t say there is ‘no point’ in 3D in it’s current forms (Terry Cavanagh’s game “Naya’s Quest” could be used to make an argument for 3D. Or more obviously Mario 3D Land). But I think for most games you sacrifice too much for the small amount you do gain. When someone works out how to display the whole light-field, THAT will be interesting. I can’t believe I hadn’t seen this yet! Thanks so much for posting. I am beyond excited lol. I didn’t know enough about optics to know if this was possible or not so it’s awesome to see that someone has actually done it (and that they work for nVidia!!). Thank you guys for posting these stereogram images in cross-eyes viewing format instead of parallel. This means that you have finally finished modeling the main character and had to make some minor changes for him. Am I right? It looks like a pair of eyes, and from the top picture, it seems like an outset perception of the castle’s eyes (external looking in). Where as the bottom looks like the perception of the entity behind the eyes (internal looking out). Eyes are suppose to represent the window of the soul. . . and it seems (if Karl Jaspers isn’t rubbing off on me, lol) that the castle’s internal perception seems large and open, whereas the external perception of the viewer looking at the castle may seem very confined and limited due to external sensory perception? I don’t know, I was looking at it symbolically or with a speculative mind, it could simply be the difference between ports, lol I don’t know??? but that’s my inference at face value.